It is becoming increasingly evident that the area on the south-western outskirts of Ramsgate is, for archaeology, very special. 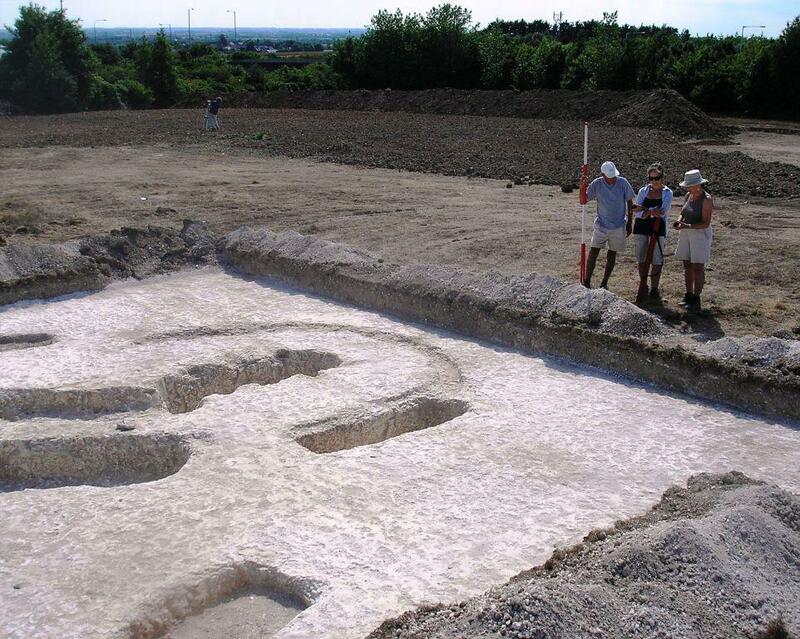 It includes Lord of the Manor (see below), Pegwell – a 2007 dig by the Trust for Thanet Archaeology (TTA) revealed a likely causewayed Neolithic enclosure (KAS Newsletter no. 77). Nearby the Ramsgate Harbour Approach Road Tunnel dig in 1996 revealed another enclosure with three circuits the outer being 150 metres across and a possible cursus (Shand, Canterbury AT). Back in 1990 Perkins wrote of Cottington Hill, Ebbsfleet, “the land surface of the hill proved to be littered with worked flints [Neolithic onwards] and pot-sherds in a density unknown elsewhere in Thanet” – this from the Thanet expert who once stated “you are never more than 35 metres from archaeology in Thanet”, (1). Finally, excavations during 2004/5 by Wessex Archaeology before a housing development at Cliffsend Farm revealed a multi period site full of interesting finds including a burial pit described as “unique in Europe” where human skeletons were laid on animal skeletons. All of these discoveries gives weight to Keith Parfitt’s comparison of Kent with Wessex,(2). All this in an area just over 2 kilometres square – at least a quarter of which is the sea at Pegwell Bay or would have been in the Wantsum Channel. For almost 40 years the phrases ‘Lord of the Manor’ and ‘Thanet Archaeology’ have been synonymous. 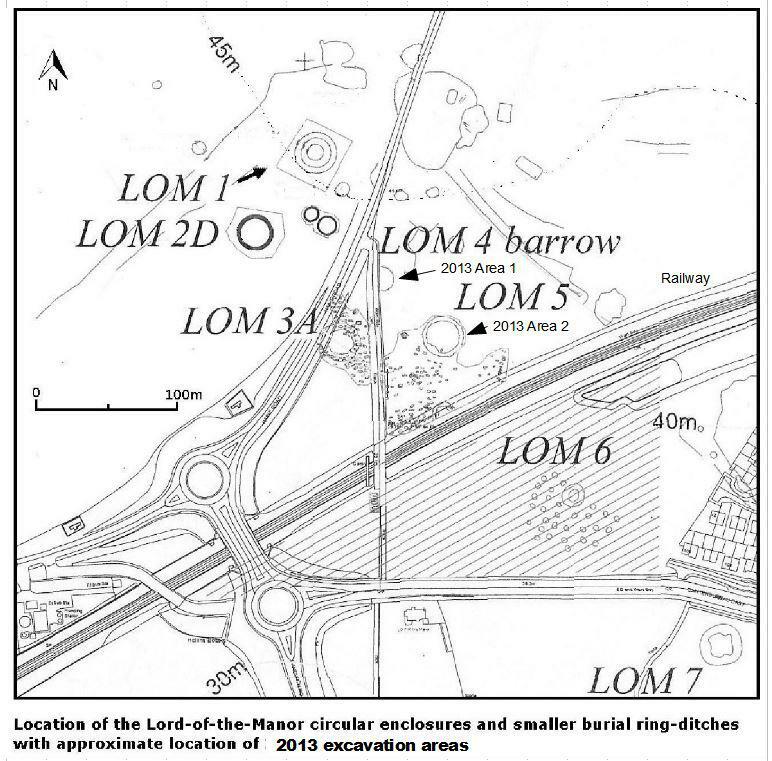 The ‘Lord of the Manor’ (an area named after a former public house at the adjacent much altered road junction of the A299 and A256 and Ozengell Grange) was excavated from 1976 to 1980 by ‘The Isle of Thanet Archaeological Unit’ (TAU) (3) and from 1987 by TTA – first director the late Dr. Dave Perkins B.Sc., and latterly by The Isle of Thanet Archaeological Society (IOTAS). Welcome continuity was provided by the presence at the first excavations and at the 2012 one week IOTAS dig by Nigel Macpherson Grant (director); the 2013 training dig by IOTAS. 2012 Excavation: The first major excavation organised and run by IOTAS involved cutting four trenches to investigate features around LOM 1 (see plan) seen in crop marks plus a single trench to clarify earlier results. Two new ditches were discovered (one suspected from crop marks) and finds included two flint arrow heads, a flint knife, a shard of Iron Age pottery and a piece of a Roman amphora. Paul Hart instructing IOTAS trainees on stratification. 2013 Excavation: A training exercise under Paul Hart to reinvestigate LOM 4 that unfortunately was half under the tarmac of the old Haine Road and partly under the field access. Also the site of the previously found Accessory Vessel housed at Quex House in Birchington, was reopened by John Villette. Trainees (society members) excavated to the original sections, recorded them, and then extended the cut as far as the area permitted. This revealed that both areas had been recut in the lower third of infill. Possibly fresh material was required to freshen up the presumed mound due to a further burial. The ditches were irregular and if extended in a circle would not meet! Finds were mostly of worked flint including one piece of Early Neolithic pottery (part of the primary infill). Finally, Anglo-Saxon graves south of LOM 5 were re-examined, some of which had post holes (six in a grave encircled by the ditch) for a canopy or some other covering. Edge of the Saxon cemetery showing grave with six post holes (within the annular ditch). Funding: IOTAS members are very grateful for the funding which assisted this training dig to take place and this was provided by Kent County Council, Ramsgate Town Council (equipment), and the ‘Allen Grove fund of the Kent Archaeological Society’. Access: Once again we are grateful to the landowner Mr David Steed (Vice President of the society) for allowing us access to his land and contractor Messrs John Reeve for stripping the topsoil at favourable cost. 1. From ‘New Archaeological Finds in Thanet’ 1990 D. Perkins B.Sc. 2. The Ringlemere Cup pg. 49. 3. TAU Interim Report 1977 – 1980 by Nigel Macpherson Grant and Dave Perkins, pg. 4 -20. The above article appeared in the Spring 2015 issue of the Kent Archaeological Society Newsletter.